While many income earners, and even students, have virtually endless options for credit cards, people with bad credit have fewer options. 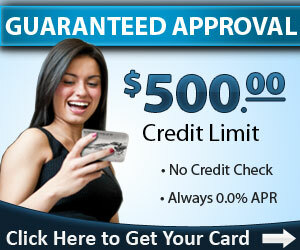 Apply for free for a Netfirst Platinum card and get instantly approved for a $500 unsecured credit limit. The Netfirst Platinum card lets you spend $500 at their Horizon Outlet online store. Even if you're strapped for cash, you can shop for clothing, electronics, toys, homeware and much more. There's no credit check, no employment check, and bad credit is accepted. Give a fantastic gift to a friend, get luggage for unexpected travel, and prepare for a new addition to the family in their baby department. Shopping online with the Netfirst Platinum card at the Horizon online outlet is safe and will help you keep track of every penny you spend. There is no APR, but there is a monthly fee for My Privacy Protection, My Universal RX, My Roadside Protect and My Legal Assistance benefits. Application is free and everyone is approved for a Netfirst Platinum card.